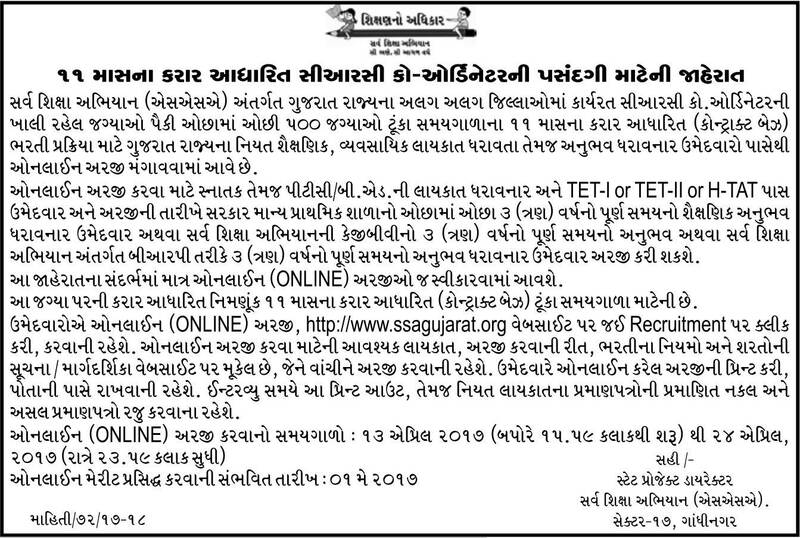 Vacancy in SSA Gujarat Recruitment 2018 Apply Online www.ssagujarat.org Assistant Warden – Full Time Teacher & Part Time Teacher Posts Jobs Career Notification Advertisement on August 2018 www.ssagujarat.org Career, Latest Job Opening at Sarva Shiksha Abhiyan (SSA) Gujarat Recruitment 2018 Apply Online Application Form Download, Latest Jobs Notification for Assistant Warden – Full Time Teacher & Part Time Teacher Posts Vacancy in SSA Gujarat Recruitment 2018. Latest Jobs Career Vacancy in SSA Gujarat Recruitment 2018. Sarva Shiksha Abhiyan (SSA) Gujarat Recruitment 2018 www.ssagujarat.org official website published a new Jobs Circular notification for Assistant Warden – Full Time Teacher & Part Time Teacher Posts vacancy on August 2018. Latest Jobs Career Opportunities in SSA Gujarat Recruitment 2018. Latest Govt. Jobs in Sarva Shiksha Abhiyan (SSA) Gujarat 2018 www.ssagujarat.org Career Recruitment news, Assistant Warden – Full Time Teacher & Part Time Teacher Posts Vacancy in SSA Gujarat Recruitment Notification Apply Online Application Form. SSA Gujarat Recruitment News for Assistant Warden – Full Time Teacher & Part Time Teacher Posts . Eligible candidates may Apply Online from 06th Aug. 2018 to 15th Aug. 2018 (www.ssagujarat.org Career). Further details of Vacancy in SSA Gujarat Recruitment 2018 for Assistant Warden – Full Time Teacher & Part Time Teacher Posts – Age, pay Scale, Eligibility Criteria, How to Apply & other details on Mentioned below. SSA project implemented by Gujarat Council of Elementary Education in Gujarat States. Sarva Shiksha Abhiyan (SSA) is Government of India’s flagship programme for achievement of Universalization of Elementary Education (UEE) in a time bound manner, as mandated by 86th amendment to the Constitution of India making free and compulsory Education to the Children of 6-14 years age group, a Fundamental Right. The programme seeks to open new schools in those habitations which do not have schooling facilities and strengthen existing school infrastructure through provision of additional class rooms, toilets, drinking water, maintenance grant and school improvement grants. 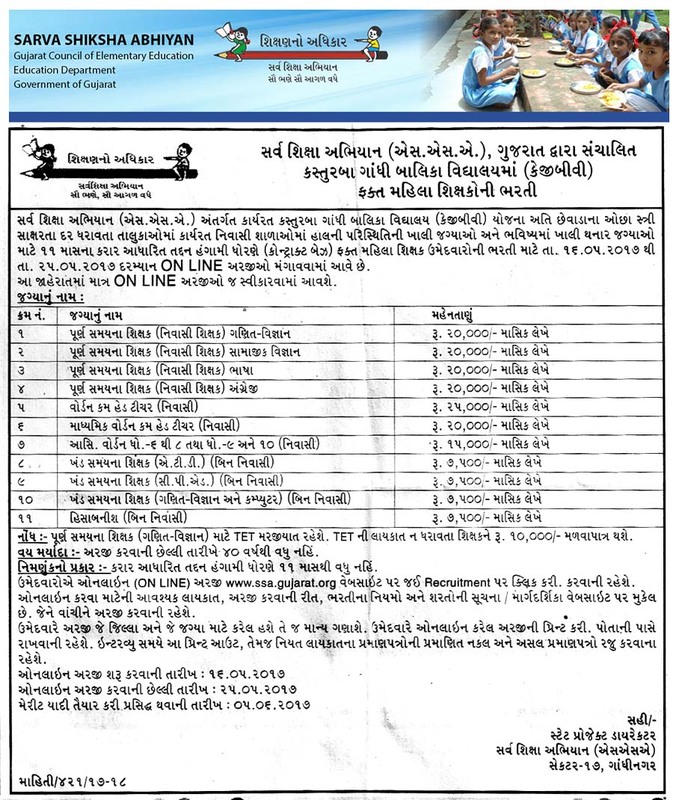 Many Job Seekers are waiting for SSA Gujarat Recruitment Notification Advertisement 2018 www.ssagujarat.org, Finally your dreams come true, on this week of August 2018 Sarva Shiksha Abhiyan (SSA) Gujarat published Notification Advertisement for Assistant Warden – Full Time Teacher & Part Time Teacher posts , Here You Can Find details Vacancy, Age Limit, Salary & how to apply for this job at SSA Gujarat on below. Name of the Recruitment /Organization Authority : Sarva Shiksha Abhiyan (SSA) Gujarat. Name of the Posts : Assistant Warden – Full Time Teacher & Part Time Teacher. No. of Posts : Posts. Closing Date of Application: 15th Aug. 2018. Stating Date For Apply Online : 06th Aug. 2018. Closing Date For Apply Online : 15th Aug. 2018. 1. Assistant Warden Rs. 15000/- per month. 2. Full Time Teacher Rs. 20000/- per month. 3. Part Time Teacher Rs. 8500/- per month. Qualification Details : 10+2 or Degree. For Above Posts Candidates can apply through online mode. Online application till open From 06th Aug. 2018 to 15th Aug. 2018. STEP 1 : Logon to www.ssagujarat.org/kgbv-redirect.html (Apply Online Link). Vacancy in SSA Gujarat Recruitment 2017 Apply Online www.ssagujarat.org KGBV Teacher Posts Jobs Career Notification Advertisement on May 2017, Latest Job Opening at Sarva Shiksha Abhiyan Gujarat (SSA Gujarat) Recruitment 2017 Apply Online Application Form Download, Latest Jobs Career Notification in SSA Gujarat Recruitment 2017 KGBV Teacher Posts. Latest Job Recruitment Vacancy in SSA Gujarat 2017. Sarva Shiksha Abhiyan Gujarat (SSA Gujarat) Recruitment 2017 www.ssagujarat.org official website published circular on KGBV Teacher Posts vacancy on May 2017. Latest Jobs Opportunities in SSA Gujarat 2017. Latest Govt. Jobs in Sarva Shiksha Abhiyan Gujarat (SSA Gujarat) 2017 www.ssagujarat.org Recruitment news, KGBV Teacher Posts Vacancy Recruitment Notification Apply Online Application Form. SSA Gujarat Recruitment News for KGBV Teacher Posts . Eligible candidates may Apply Online Form 16th May. 2017 to 25th May. 2017 (www.ssagujarat.org ). Further details of Vacancy in SSA Gujarat Recruitment 2017 KGBV Teacher Posts – Age, pay Scale & other details see on below. Many Job Seekers are waiting for SSA Gujarat www.ssagujarat.org Recruitment Notification Advertisement 2017, Finally your dreams come true, on this week of May 2017 Sarva Shiksha Abhiyan Gujarat (SSA Gujarat) published Notification Advertisement for the KGBV Teacher posts , Here You Can Find details Vacancy, Age Limit, Salary & how to apply for this job at SSA Gujarat on below. Starting Date for Apply Online : 16th May. 2017. Closing Date for Apply Online : 25th May. 2017. For Details of like No. of Posts, Age Limit, Pay Scale & Qualification Information Please Check The Advt. Details Below. For Above Posts Candidates can apply through online mode. Online application till open 16th 2017 to 25th May. 2017. STEP 1 : Logon to www.ssagujarat.org (Apply Online Link). STEP 3 : Now, Read all details and be ready with the necessary documents mentioned above and then click on “Apply Online ” and Fill up the ONLINE Application form with all your details. Vacancy in SSA Gujarat Recruitment 2017 Apply Online www.ssagujarat.org 500 CRC Co-Ordinator Posts Jobs Career Notification Advertisement on April 2017, Latest Job Opening at Sarva Shiksha Abhiyan – Gujarat Recruitment 2017 Apply Online Application Form Download, Latest Jobs Career Notification in SSA Gujarat Recruitment 2017 500 CRC Co-Ordinator Posts. Latest Job Recruitment Vacancy in SSA Gujarat 2017. Sarva Shiksha Abhiyan – Gujarat Recruitment 2017 www.ssagujarat.org official website published circular on 500 CRC Co-Ordinator Posts vacancy on April 2017. Latest Jobs Opportunities in SSA Gujarat 2017. Latest Govt. Jobs in Sarva Shiksha Abhiyan – Gujarat 2017 www.ssagujarat.org Recruitment news, CRC Co-Ordinator 500 Posts Vacancy Recruitment Notification Apply Online Application Form. SSA Gujarat Recruitment News for CRC Co-Ordinator Posts . Eligible candidates may Apply Online Form 13/04/2017 to 24/04/2017 (www.ssagujarat.org ). Further details of Vacancy in SSA Gujarat Recruitment CRC Co-Ordinator Posts 2017 – Age, pay Scale & other details see on below. Many Job Seekers are waiting for SSA Gujarat www.ssagujarat.org Recruitment Notification Advertisement 2017, Finally your dreams come true, on this week of April 2017Sarva Shiksha Abhiyan – Gujarat published Notification Advertisement for the CRC Co-Ordinator posts , Here You Can Find details Vacancy, Age Limit, Salary & how to apply for this job at SSA Gujarat on below. Starting Date for Apply Online : 13/04/2017. Closing Date for Apply Online : 24/04/2017. 1. CRC Co-Ordinator 500 Check Advt. Qualification Details for CRC Co-Ordinator Posts : Passed Graduation Degree / Post Graduation Degree or its equivalent with good marks from a recognized University / Institution. For Above Posts Candidates can apply through online mode. Online application till open 13/04/2017 to 24/04/2017. STEP 1 : Logon to http://www.ssagujarat.org/ (Official Website).